The Watercolors in the Rain Advent Calendar starts on December 1 and runs until December 24. 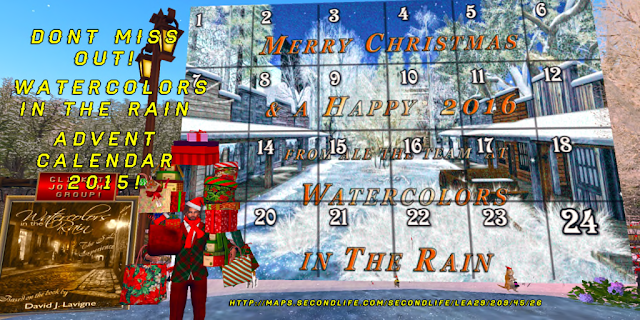 This unique sim is based on the real life novel Watercolors in the Rain by David Lavigne. Don't miss out on any of the great 24 Advent Calendar gifts we have for you, some of which include a ridable Santa sleigh, Christmas Pet Lanterns, a Kissing Mistletoe Archway, an animated Christmas cards set and an exclusive limited edition Queen Victoria EVO Fairy, based on the character taken directly from the Watercolors in the Rain novel. All these and many more! See you there!